These are non-contact classes for boys and girls aged 9 to 16 years and are suitable for all levels, from beginners upwards. 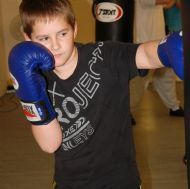 The workouts are perfect for youngsters looking to begin boxing training and keeping fit. These workouts involve basic boxing techniques; shadow boxing, bag work, circuit training, running and skipping. Please note that there is no sparring during these sessions.